On Thursday, October 25, ethnomusicologist Victoria Levine will come to Swarthmore’s campus to present a lecture titled “Everything You Know About Indian Music is Wrong.” Levine is a professor of music at Colorado College, located on traditional lands of Ute, Cheyenne, and Arapaho people. She focuses her research on music in Indigenous ceremonial life, musical revitalization, historical ethnomusicology, and the circulation of music along trade routes. Professor Levine’s provocative title originates from Paul Chaat Smith’s book of the same name. In this lecture, Professor Levine intends to answer four questions: How did modernity affect Native music? Do Native musicians have music theory? Can Native women make music? 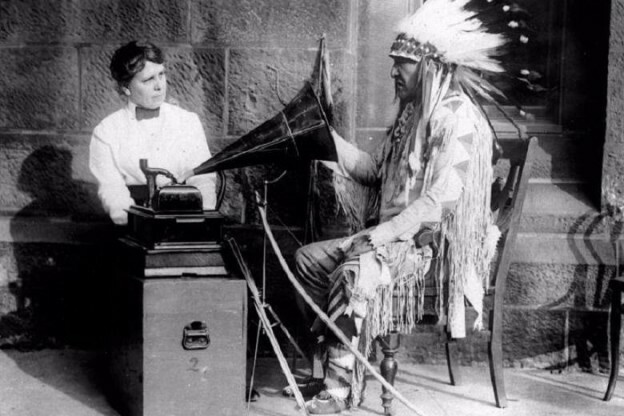 What is the history of Native music? In order to tackle these four questions, Professor Levine draws upon the work of Native and settler scholars as well as her own research. She poses these four critical questions as an opening to begin challenging herself as an ethnomusicologist of settler descent and to challenge audience assumptions about Indigenous music and musicians. Professor Levine’s lecture is the annual Peter Gram Swing (PGS) Lecture, an event established in the honor of the founder of Swarthmore’s Music Department. The idea to invite Professor Levine as part of this annual event was first proposed by Swarthmore Music Professor Lei Ouyang Bryant, who saw an opportunity to bring a scholar of Native American music and culture to Swarthmore since there are no current specialists present on campus. Other members of the Music Faculty were immediately enthusiastic. “I’d also like to single out the advocacy of a current Swarthmore student, Julia Wakeford, who had met Professor Levine, knew her work, and encouraged us to invite her, without knowing that we were already thinking along the same lines,” Professor Whitman continued. Though Professor Levine’s lecture is not a part of any Swarthmore class semester, Professor Bryant tries to incorporate related events into her own course. “I try to incorporate related campus events in my ‘Music and Dance Cultures of the World’ course, so my students will be attending the lecture and writing a short response for our class,” Professor Bryant said. This lecture is an opportunity to address topics that are not covered currently in any Swarthmore music classes. Moreover, this event provides space for a group who has been historically underrepresented. “I believe Professor Levine’s lecture will provide an opportunity to both challenge and extend one’s current knowledge and awareness,” Professor Bryant added. Professor Levine’s lecture will be located in the Lang Concert Hall and will occur on Thursday, October 25 at 4:30pm. This entry was posted in Music on October 23, 2018 by dpulley1.